The Niremont (1,514 m) is a mountain of the Swiss Prealps, in the canton of Fribourg. Due to its rounded shape, it has 2 sub-summits : The Gros Niremont (1,481 m) and the Petit Niremont (1,493 m). Its name means Noir Mont in French ("Black Mountain"). 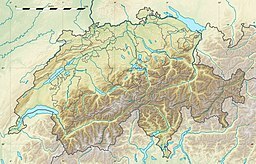 The Noirmont stands between the Swiss plateau and the Swiss Alps. The city of Châtel-St-Denis and the A12 motorway are located on its western foot. The panorama from its summit offers a nice view on the Moléson, the village of Les Paccots, the lake of Geneva and the Jura Mountains. Several small tributaries on the west slopes feed the Trême river. On its south side lies the Veveyse de Châtel river, feeding the lake of Geneva. The Niremont is covered with pine forests, wetlands and mires. A great proportion (402 hectares) is registered on the Inventory of Mire Landscapes of Particular Beauty and National Importance. The small ski resort of Rathvel lies on its eastern slopes. The Niremont is a popular destination for hiking, mountain biking, snowshoeing and ski touring. ^ Retrieved from the Swisstopo topographic map (1:25,000). The key col is located near Ratvel at 1,225 metres. ^ "Office Fédéral de l'Environnement, inventaire des sites marécageux (in French)". Archived from the original on 14 December 2014. Retrieved 10 December 2014. This page was last edited on 20 February 2018, at 04:04 (UTC).